Owning a bicycle becomes inconvenient when you think about storage space in this era of apartment houses, city dwelling and townhouses. Nonetheless, this is something you can’t escape from because you can’t ride your bike a whole day. Bikers love their bikes so much and the last thing they want is normally to carelessly throw their bikes outdoors. 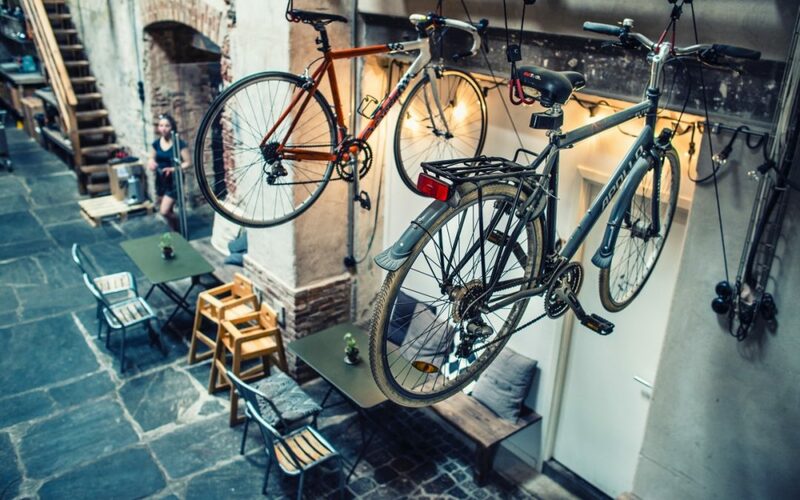 In fact, they want a solution for their bike storage that will last long, save space, allow you to install it with ease and ensure their bike safety. Depending on where you live, you can buy a bike storage shed, hook, rack that you will use within the house or outside. Alternatively, create some space in your garage. If you live in a house that has a garage you are lucky because storage is easy. The garage is where you will have your car, motorbike, bicycles and other essential work protective gear like the boots, aprons helmet, gloves etcetera. Note that, every house has a different garage. Organizing the garage is however essential because the safety of your bikes, finding your items and having a presentable garage is assured. If you don’t organize your garage, you become susceptible to accidents. Remember a garage stores even sharp object. Although you may have a minimal space, with a proper plan, all the things that you thought couldn’t fit in the garage will fit. Go in with the aim of de-cluttering then get rid of things you don’t need. Sort your boxes and find the gadgets you no longer need and give away to create space and maintain cleanliness. 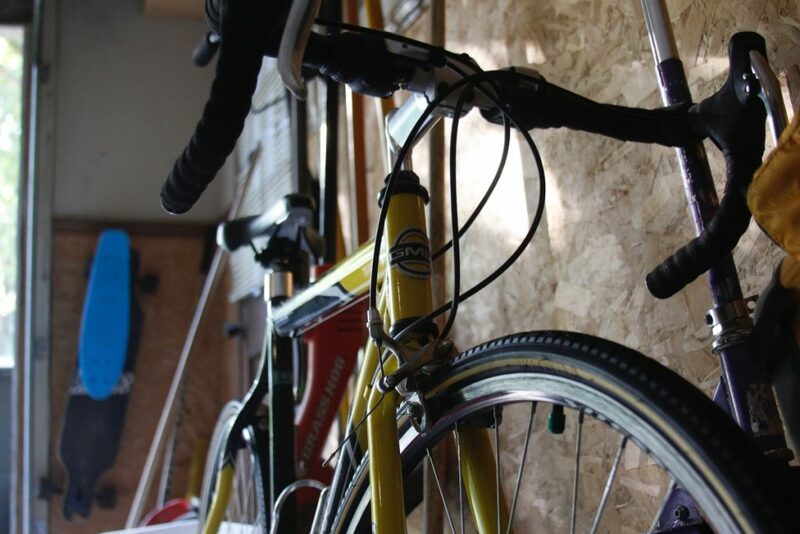 Your garage floor is minimal so install some shelves on the walls to help store the bikes. Otherwise, make use of the ideal steadyrack system and vertical storage to keep your bikes. Remember to choose the correct height for your bike to avoid the heavy lifting of the bike when it’s needed. This is another economic outdoor solution for your bike. It will help you to keep your bicycle, pool equipment and gardening tools neatly and readily accessible. It can store up to 2 adult bikes while keeping them safe from water and dust. It has 2 heavy duty zips on the top and bottom as well as a seal door for enhanced safety. Its roof is made of vinyl tarpaulin which makes it durable. Since it’s an outdoor storage system it has a back Velcro flap to secure the bike on the fence. The outer body is made using the UV protected polyester that has a strong weatherproof coating thus enhancing its quality. It has a well-integrated secure floor that keeps your bikes in position and out of sight for intruders. 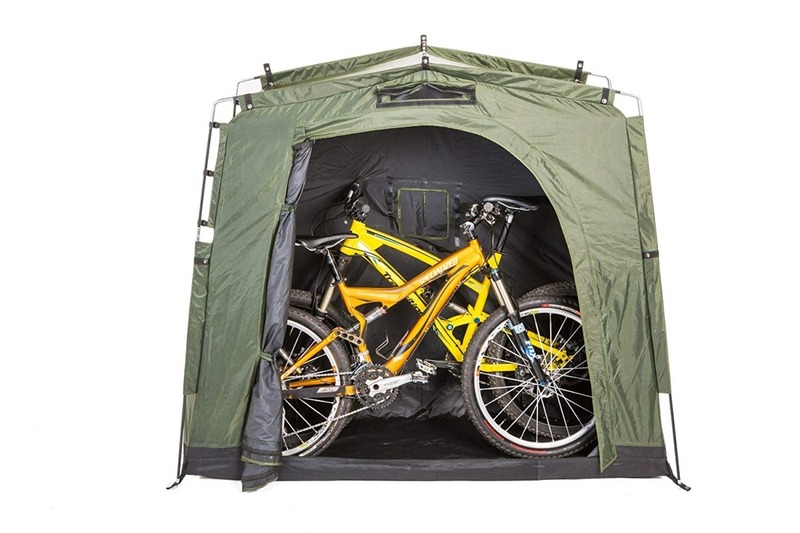 Although it looks like a tent, the bike storage design is sturdy in construction and lightweight. It’s also easy to install when you follow the set instructions. Aside from all these, the yardstash III is portable which makes it conducive for use. This hanging system is vastly encouraged by customers even though most people have always used the vertical hanging system. It’s an elegant and durable hanger made of aluminum and It’s ideal when saving space. It has padded double ABS arms to avoid scratching your bike or removing the paint. It further can fit both narrow and wide handlebars. Ibera hanger features an adjustable 45˚ hanger’s angle. You can adjust the wall hangers fit both small and non-standard frames. It’s easy to install, as long as your wall is made of concrete, wood or masonry. It comes with the necessary mounting hardware to make your work easy. Here is a disclaimer though: never hang it on a drywall or plasterboard. It has the bonus Velcro strap to prevent your bikes front wheel from swinging sideways. It gives you a 30 days satisfaction guarantee of 100% money back guarantee. The Ibera wall hanger features a sturdy construction for those with the right wall material. If you don’t have the concrete within the house, consider mounting your hanger outside. This is a super space saving method that considers your bike’s safety by shielding it from falling and scratching. 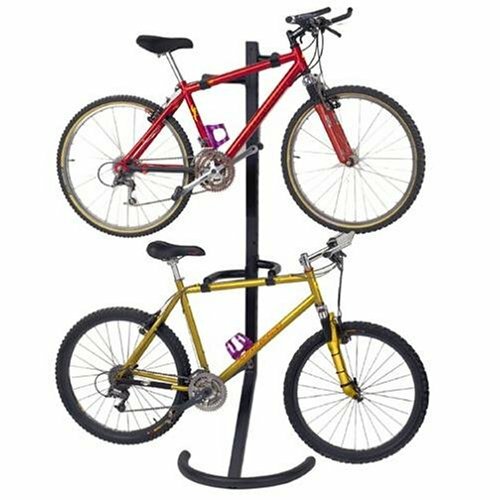 It features a freestanding rack that will support your 2 bikes. It weighs 20 pounds but can carry up to 100 pounds (2 bikes). It’s easy to move and reposition because of its weight yet it gives you a lifetime warranty. It has two independent adjustable arms to accommodate the male and female bikes. It has a skid-free rubber guard for safety and stability of your bikes. The design offers a sturdy construction. Its construction is made to last with its heavy-duty steel and epoxy finish. Additionally, its arms have a vinyl finish which protects your bike against scratching. You can easily reposition the arms for it to meet any bike’s dimensions. Anyone can install the hanger because you need no specialty and there are no tools needed to aid the assembly. This design will save your space if that’s your issue of concern. It allows you to rail mount the bike on the ceiling joist. Its design is unique, flexible and stylish. 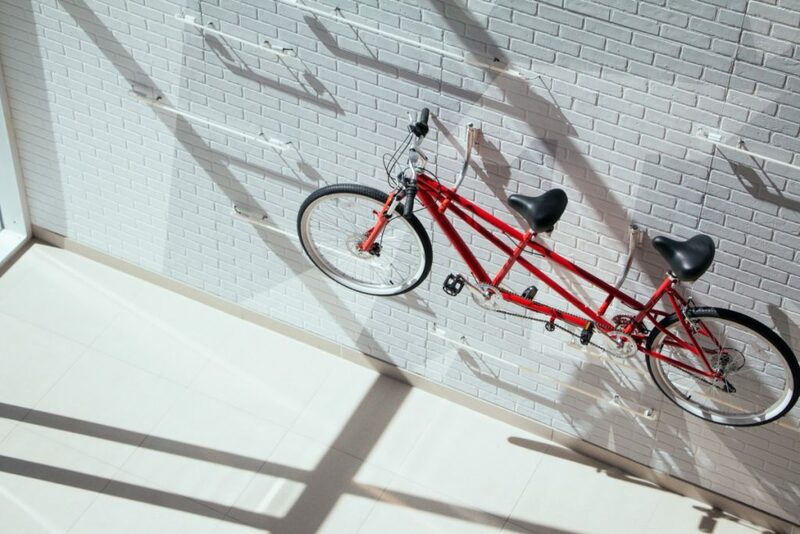 You may adjust the hooks which makes it easy for you to mount bikes of different sizes. The bikes hooks are designed with rubber coating to protect your bike from scratches. The aluminum made bike host is durable and rust free. 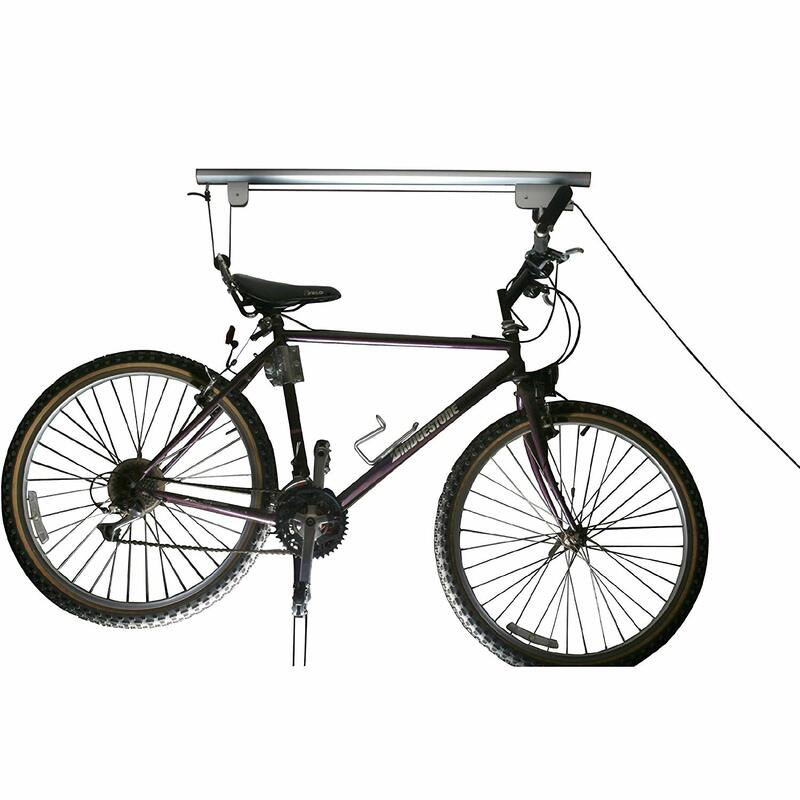 It works on ceilings of up to 12 ft with a safe lock system to protect your bike against the possibility of releasing. It also has a thick premium ladder lift to help raise your bike to place. The rope lock system secures the bike with a firm pull. So, there you have an even better system to store your bike overhead and away. As you can see, there are many options to store your bike. But, when it comes to buying one that suits your space you need to research and think of what suits you best. Remember, the market is flooded with bike storage options so take time before making a choice.